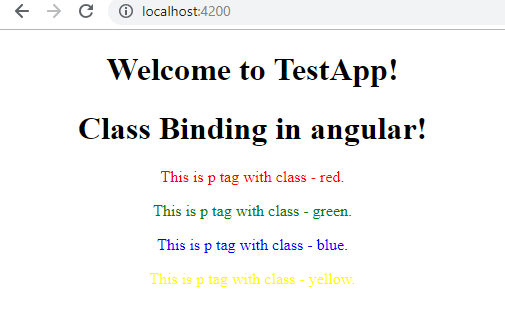 In this article, we are going to learn how to bind property, class, styles of HTML in Angular. In this article, we are going to learn how to bind property, class, and styles of HTML in Angular. For creating a new application run the below command at any location. Once your command is completed you will have to TestApp the folder created inside your sample folder. Now, you will have your project folder called 'TestApp'. See my previous article “Getting started with Angular CLI” If you want the installation and introduction from the basics and start with the execution of a sample application. Attribute and property are not the same. The attribute is defined by HTML while the property is defined by DOM. Attribute initializes the DOM property and cannot change once they are initialized. Property can be changed. Run the application. Inspect the element input text box. $0 represents the current element and the attribute value is set to the given value. Let us change the input textbox value and inspect and check the value. You can see the attribute value is the same as it was initialized but the property value is changed anytime. Let us add a property value inside the class and use that ID in your HTML. Open test.component.ts and add the below property. Better way to bind the property is to enclose the id inside  bracket and assign that ID to it. When you inspect this element you will find that this is set as an ID attribute with ‘test’ ID assign to it. This is how we do property binding. Now, we are going to do the same thing with the help of interpolation. Inspect the same browser you will find the same result. There are certain limitations of Interpolation. It can only work with string values. Sometimes the situation arises when we need to deal with the Boolean value in the property. Eg: disabled property. When we define disabled property it automatically initializes it to false. Interpolation doesn’t work on Boolean value. So it will not affect on giving it a value. Then it will be working according to its Boolean value and enable/disable in browser. The textbox should not be disabled, as we have defined value of ‘disableControl’ to false just because interpolation is not working with Boolean value. So to make it work add the below content. This time the textbox is not disabled and works with the value assigned to it. There is an alternative way to bind the property to the element. You can use ‘bind-‘ prefix with the property name to bind it. We don’t need to use brackets. This is all about property binding in Angular. Let us create a CSS class as below. Open test.component.css and add the below content. The most common way to apply a class is to use ‘class’ attribute. In order to bind a class to your HTML from property defined in component class. Declare property in your component class. Open test.component.ts and add below content. Define class on the basis of condition. Now, this class will be applied depending on the value true/false of set Red property. This directive is used to apply multiple class to HTML tag element. Open test.comonent.html and add below content. In a classObj object, the ngClass will check which classes are true and need to be applied. It is very useful to add the class dynamically and remove the class whenever not required in HTML based on user requirements. So, in your component class, you will need to specify the properties to apply bases on which the template will be utilizing the class values. Let us try binding an inline style to the HTML element. We can also bind the inline style on the basis of the condition. Inside component class declare the ‘hasColor’ property. We can also add style object which contains multiple styles.